We have experience with WordPress plugins, having created the successful Ultimate Membership Pro & Ultimate Affiliate Pro plugins. 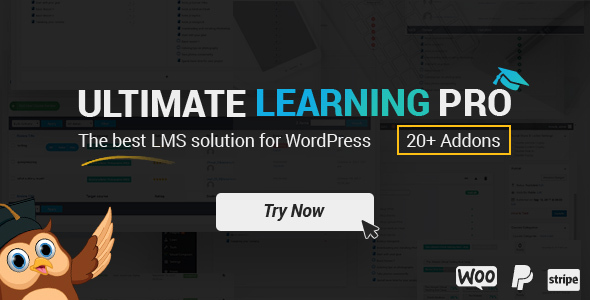 Ultimate Learning Pro is the most feature rich LMS Plugin out there and what sets us apart is that we give you ALL the features from the start. We don’t have hidden costs or paywall features. Easily create, edit and maintain online courses with our friendly user interface. With Ultimate Learning Pro your users can register to automatically become Students and/or Instructors or you can manually add them. You can even add multiple Instructors. Your users can use PayPal’s direct payment method. Your users can use Stripe’s direct payment method. You can link a course to a Ultimate Membership Pro level. Your users can use the payment methods integrated in WooCommerce. Special form generated by the plugin where your students can take notes during courses. Set up badges to reward your students for completing certain conditions. Reward your students with points when they answer questions, finish a quiz, lesson or course. Use points as a prerequisite condition for your courses. Lets your students save a course to their personal wish list for later use. Students will be able to see their grades in a special form generated by the plugin. Certificates can be added for courses, they are given to your students upon completion of the course. Help your sales grow by having honest reviews of your courses written by students. Define difficulty levels and assign them to your courses to help potential customers make the right choice. Set up an estimation of how much time it will take to finish this course. Highlight a course in the public section to attract interest to it with just one button click. Determine if a course is free or paid and set up the price. Make a lesson available for everyone so they can get an idea of how the course is like. Control when a lesson becomes available for your students by scheduling content releases. Establish the minimum amount of time a user must spend on a lesson in order to avoid a user clicking next, next to pass through a lesson with ease. Set a number of minutes after which the quiz will end. Display the questions of a quiz in a random order every time. Display the multi-choice answers in a random order every time. Establish the minimum grade a user must obtain in order to pass a quiz or course. Create notifications which will be received by your users on mobile via Pushover. Ultimate Learning Pro has the functionality to add multiple instructors to a course, this is available from the beginning for no extra cost. MyCred is integrated in ULP, allowing your users to earn points for certain actions, you have full control over these. Allow your users access to their invoice(s). BuddyPress is integrated in Ultimate Learning Pro, adding a new tab to your BuddyPress public profile. ULP allows the addition of new currencies alongside the predefined list based on custom symbols. You can create and reorder the account page menu items. If you want to use Ultimate Learning Pro plugin, all you need to do is install WordPress 3.0+ with PHP 5.4+, and install the plugin. This entry was posted in Wordpress Plugins and tagged certificates, courses, depositfiles.com, download free, download plugin.rar, download plugin.zip, download rar, download wordpress plugin, download zip, education, elearning, free, free wordpress plugin, get rar, get zip, Index Of, learning, lms, membership, mirrorcreator.com, nowdownload.ch, nulled, nulled plugin, Parent Directory, paypal, rar, stripe, students, training, ul.to, wordpress education, WordPress learning, wp lms, zip, zippyshare.com by wordpress. Bookmark the permalink.